The serene design belies a complexity of features that make this a sustainable and more environmentally friendly building. In the design phase, the proposed objective was for a building that could work naturally, without mechanical support systems and with the lowest possible energy consumption. Multiple strategies were considered for thermal insulation, solar protection, natural ventilation, rainwater harvesting for the water “mirror”, energy-saving devices and high efficiency lighting systems. 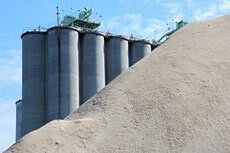 Cemex USA’s Louisville plant picks up three awards at the 11th Annual Cement Industry Environment and Energy Awards.